SPB: So Al, what got you into playing the trumpet? AW: Well you see it was my parents. They had aspirations that I play in a German Brass Band playing polkas and waltzes. It was (and still is) a stereotypical oom-pah band that had ties to a club my parents belonged to. It was in 1970 when I first saw the band play at a club picnic and my dad asked me what instrument I would like to play. I told him I liked the saxophone. It had a different sound and it looked pretty cool. My dad pretty much said that I would be playing the trumpet. That’s about it in a nutshell. AW: Yeah, it was June of 1970 when my dad figured it was the time was about right to start taking lessons. After 8 months, I was playing in a band. By the age of 12, I was performing for picnics, dances, and the Oktoberfest. It took a while before I actually could play through an entire song without getting lost. I pretty much hated all the practicing and going to lessons in general– I can remember the frustrations of just not being able to get it. SPB: Why didn’t you quit playing? AW: You had to know my folks. They had their way of motivating me – Olde World style if you catch my drift. 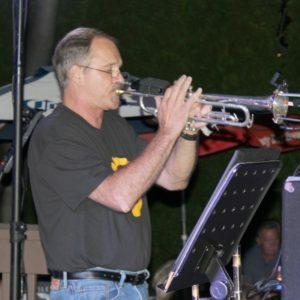 It paid off in the end, because in high school, I began to really enjoy playing and had some good influences in the form of the Wickliffe High School band director as well as the Brass Band director – yup I was and continue to play in the brass band – you just can’t get away from your heritage. The brass band did tour Germany and Austria twice. After high school, I hooked up with some friends and as a way to kill time on the weekends, we began learning Blues Brothers songs after listening to albums. Little did I know then that those nights out with the boys would turn into a 27-year stint known today as Pieces of Eight Featuring the Lakeside Brass. Sorry about that shameless plug but it does lend itself as a nice segue into my association with Stone Pony. SPB: That’s right, we asked you to play out for an evening at one of your Pieces of Eight gigs as a substitute. AW: Yeah, even though I was hesitant about it, I figured one time couldn’t hurt – I hadn’t planned on more than that, but as time went by, you gave me more and more opportunities to drink some beer…er…fill out the horn line at gigs and rehearsals. You guys made me feel like one of the boys right from the start. SPB: You’ve been doing this for over a quarter of a century, how long do you figure you’ll keep doing this? I assume you have a day job that you have to schedule around too? AW: In my ‘normal’ job, I work as a Design Engineer at the Perry Nuclear Plant. It does keep me on my toes and electricity is something that is produced 24-7, so there have been times where conflicts have come up, but my supervision has been pretty cool about it. As far as playing, I’d like to think I’ll be doing it as long as its fun, and cold domestic lite beer is served. Speaking of which, I could use another cold one. These walks down memory lane do make one thirsty…..